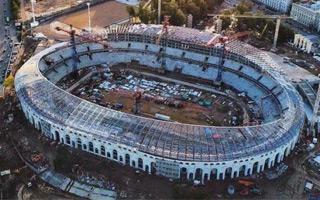 Along the official contract the complete reconstruction of Stadion Dinama was supposed to end in December, 2017. However, there can be no talk of handover at this point, the project is significantly behind schedule despite 1,100 people working around the clock. According to current plan the building should be opened to the public in June, which means roughly 5 months of delays. At present roof cladding is being mounted, while floodlight masts are being assembled on the field. Once ready, they will be placed outside the venue. When the above-mentioned works are done, tower cranes can finally be removed, making way for future Mondo running track and new football field. Already now green, red and white seats are installed throughout the lower east stand, moving towards the main, west side. Altogether some 22,000 should be in place, topped by green-glass fronts of the hospitality area and commentator cabins. Outside the main stand glass is being mounted onto its facade. 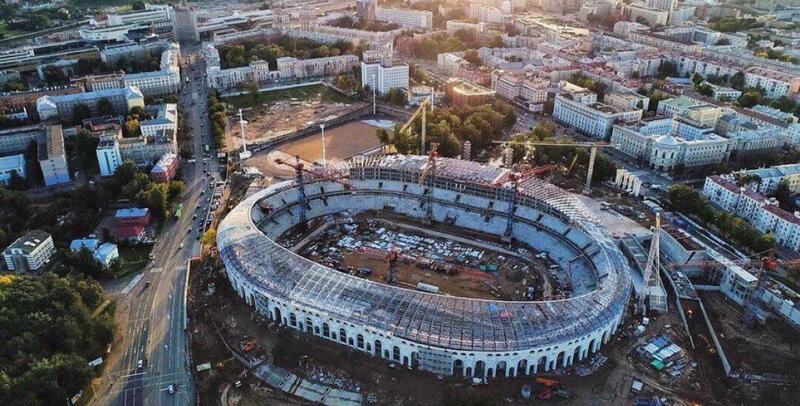 Complete reconstruction of the Belarusian national stadium began in 2014. In 2019 the building will host European Games, welcoming the tournament as second-ever hosts after Baku, Azerbaijan.